Acetabular Labral Tear typically present after an athlete has experienced some form of trauma such as slipping, twisting, or dislocation. Labral tears can also be associated with osteoarthritis. The differential diagnosis includes external and internal snapping hip, osteonecrosis, and synovial chondromatosis. The acetabular labrum is a fibrocartilaginous rim around the bony acetabulum. The function of the acetabular labrum is to add stability by deepening the hip socket, creating a negative intraarticular pressure, and preserving the fluid-film layer in the joint. Inferiorly, the labrum is contiguous with the transverse acetabular ligament and defines the lateral edge of the acetabulum. Free nerve endings have been found in all areas of the labrum, so a tear may cause pain in a way similar to that of a tear of the meniscus. Tears of the labrum typically present after an athlete has experienced some form of trauma such as slipping, twisting, or dislocation. Labral tears can also be associated with osteoarthritis. 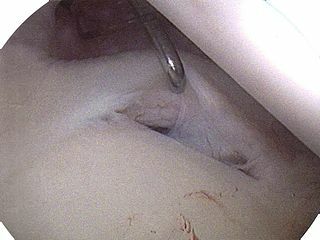 Classic symptoms of a torn labrum include painful catching or clicking, episodes of sharp pain precipitated by pivoting or twisting, worsening pain with extension, and a feeling that the hip is “giving way.” Physical exam reveals palpable clicking on Thomas flexion to-extension, which frequently correlates with the finding of Labral Tear at arthroscopy. Bringing the hip from full flexion, external rotation, and abduction into extension with internal rotation and adduction is useful in diagnosing anterior labral tears; and bringing the hip from full flexion, adduction, and internal rotation to extension with abduction and external rotation is reported by some experts as useful for posterior labral tears. However, Browder et al. found an inter-examiner reliability of only 48%. Plain radiographs are essential in that they can show other sources of intra-articular disease that can account for the symptoms. MRI can be useful in further screening for osteonecrosis, synovial chondromatosis, and other diseases. Injection of local anesthetic into the joint guided by fluoroscopy can also be useful in diagnosing labral tears. If the symptoms resolve after injection, an intra-articular etiology is more likely. Hip arthroscopy or magnetic resonance arthrography (MRA) are the diagnostic investigations of choice in acetabular labral tear diagnosis. MRA has reported sensitivities greater than 90%. The differential diagnosis includes groin sprain, hernia, snapping hip syndrome, and osteitis pubis. Conservative management with anti-inflammatory medications and physical therapy may be useful. Once the diagnosis is made, some authors recommend protected weight-bearing for 4 weeks. Subsequently, if conservative measures fail, surgical intervention by hip arthroscopy should be offered. This is also the preferred method of treatment for many experts.